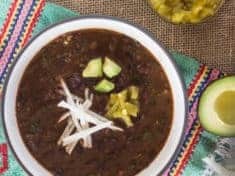 Seasoned with smoky chipotle chiles, mild tomato salsa, and green chiles, this spicy black bean chili with hearty greens will rock your chili world. 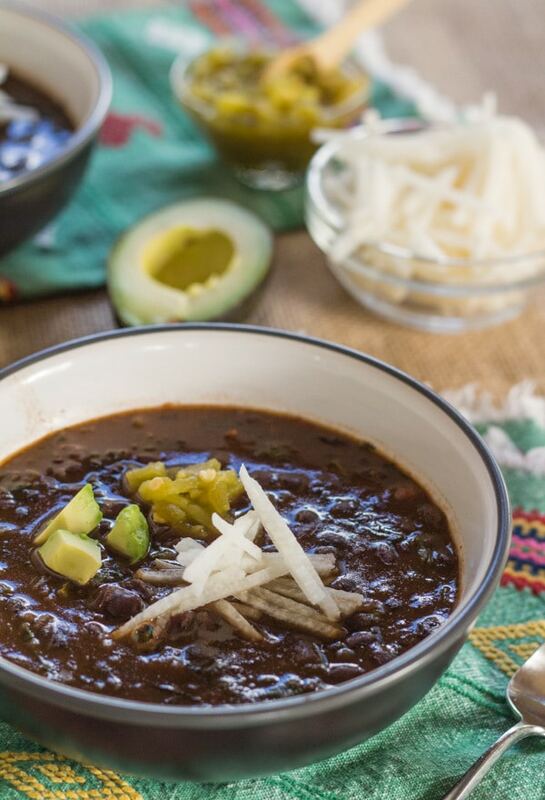 You will totally love how the greens balance the already vibrant flavors of this nourishing vegetarian chili. In addition to the greens, a lot of the depth and balance in this chili comes from smoked and dried jalapeños in sweet tangy, spiced puree of tomatoes and vinegar–chipotles in adobo. They’re spicy hot and the small amount of chipotle chile adds that perfect smoky heat. 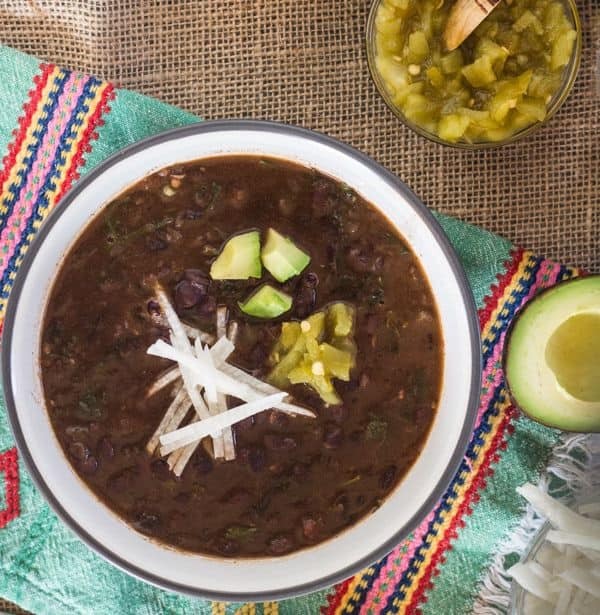 Click here to PIN Spicy Black Bean Chili with Hearty Greens! Five minutes after you stir the dark leafy greens into the pot, what at first seems like too many greens melts, practically disappears, into the hot beans. The vitamin-rich greens can be arugula, beet greens, mustard greens, or a mess ‘o greens mix, like the ready-to-cook Southern greens you can sometimes find at Trader Joes. 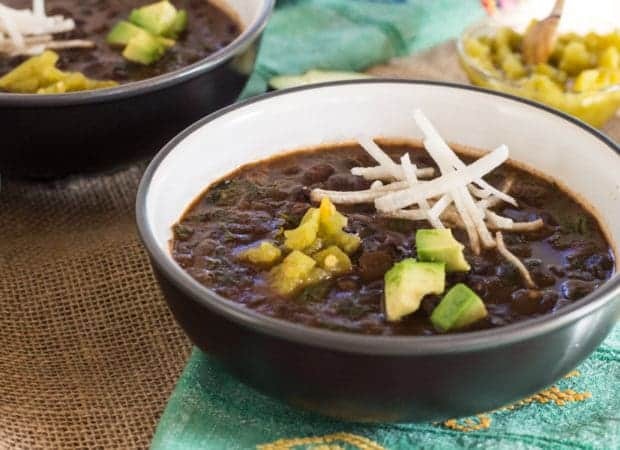 This spicy black bean chili is finished with a vegan garnish, of jicama matchsticks, creamy avocado, and diced green chiles. If you like, round out your chili with salty cotija or feta cheese, or sour cream. Serve with cornbread or a crusty loaf of bread. The way I see it, pressure-cooking is the only way to cook beans. 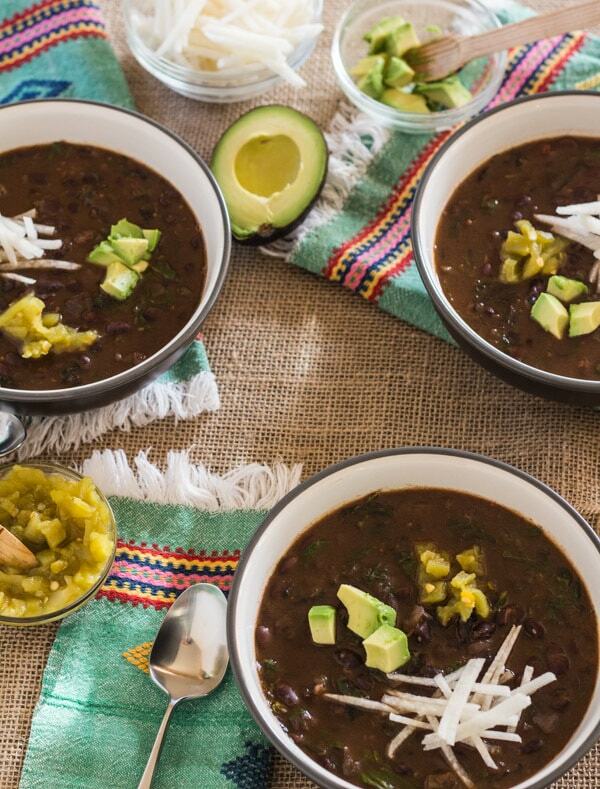 This recipe shows you how to cook the soaked-overnight black beans in 13 minutes. Tack on sautéing onions and spices in the beginning, and adding greens at the end, in a realistic 40 minutes, you’ve got a comforting cool weather supper. From scratch: Depending on the age of the beans, and whether or not you’ve soaked the beans beforehand, cooking time will be 1 to 3 hours on a medium simmer. You’ll need to use more water than the pressure cooker recipe. Keep an eye on the water level as the beans cook, always keeping them covered with liquid. With canned beans: Saute the onions and garlic per recipe. 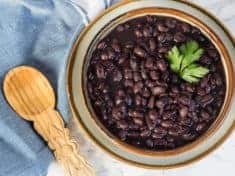 Substitute 4 cans rinsed and drained black beans for the dried beans. 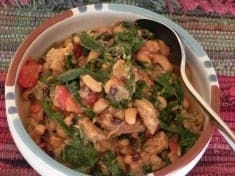 To meld all the flavors into the beans, cook covered on medium low flame about 30 minutes before stirring in the greens. Be sure to inspect the beans before soaking and pick out any small stones masquerading as beans. Cover soaking beans with plenty of water—at least 6 cups. If you didn’t pre-soak the beans, cook 35 to 40 minutes in the pressure cooker. Have you ever bought a can of chipotles, used one or two, and then wondered what to do with the rest? Do this: Blend the spicy chiles right out of the can, with just enough oil to smoothen them out. Use what you need, and store what’s left in the freezer. To add chipotle chile smoky complexity to a recipe later, warm the container in hot water, just long enough to coax the frozen sauce out onto a cutting board. Slice off what you need and pop the container back in the freezer. Adobe red chipotle oil will jazz up vinaigrette, mayonnaise, pizza, and, of course, spicy black bean chili with hearty greens! The chipotle chile oil idea comes from my favorite cookbook author, Deborah Madison. Here’s another recipe you might like. The ample amount of greens shrink incredibly in this–spaghetti with beet greens. 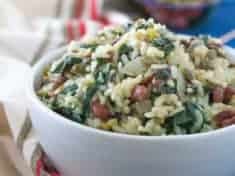 **This recipe first appeared on Pressure Cooking Today where I’m a contributor. Wishing you a fabulous week–get in the kitchen and cook something hot and comforting!